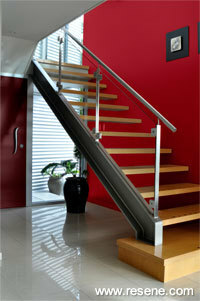 Get the look with Resene Bullseye as a stairwell wall feature and Resene Jumpstart on the front door. There’s no quicker, easier or more affordable way to make a statement in a room than to give it a coat of brightly coloured paint, but if you’re nervous about using too much colour, you can play it safe, but still make a statement, by introducing a feature wall. Feature walls – now often referred to as statement walls – add vibrancy and personality without overpowering the rest of the room, and they allow you to be more daring with colour without having to go all out. Paint is not your only option though. There are many other creative alternatives. While a statement wall provides a focal point to a room, it can also transform it, making it appear larger or wider, cooler or warmer, even more intimate. A statement wall can enhance a room’s best features or downplay its weaknesses. A bold floral design, for example, not only injects personality, it can help to disguise uneven walls, and stripes are a great tool for increasing the sense of space within a room. Accent colours are also a means of changing the mood of a room. Brilliant colours give a room energy and vibrancy while softer, tonal colours create a calming, relaxed atmosphere. Whether using adventurous colours or more toned-down hues, feature walls can help to anchor or define separate areas within large spaces. 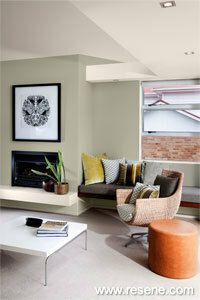 In a living room, an accent colour may be used on one wall to define it as a reading corner. In an open plan kitchen a feature wall may be used to mark out the dining area. Splashbacks are another place for adding colour in the kitchen, but current trends have seen a shift away from the ever-popular red to other cheerful colours also coming into use. As a general rule, feature walls are located around some kind of focal point in the room – a chimney breast, the wall that your TV hangs on, or the bed head wall in your bedroom. Or it could be the wall that you first see as you enter the house. But Sarah says there are other tricks homeowners can try to create interest. “What you can do now is to wallpaper opposite sides of the room and then paint the other two. So you’re not doing all of the room but you’re doing the opposite walls. It works really well on long skinny rooms. Using different paint sheens also adds eye appeal. While low sheens are usually used on interior walls, using a mix of low and high sheen can impart that wow factor. Or you can use colour to complement artwork. Accessories, like cushions, curtains and plant pots, can be used to bring out the colours in accent walls too. “I always suggest that people take The Range fashion colour fandeck with them when shopping for their cushions so that they can match up the colours that they really like,” says Sarah. Feature walls can be taken outdoors too and used to partition off areas, or as a backdrop for water features, plant pots, urns, sculptures and espaliered plants. “I love feature walls in the landscape,” says landscape designer Sandra Batley of Flourish. “And they don’t need to be boring". “Feature walls can have a simple water weir built into them to transform it into a water feature. Or outdoor sculptures and weatherproof art can be attached. 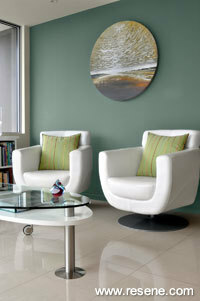 Vertical walls or green walls are a huge trend.” There are fabulous colour choices for coloured feature walls. One of the best ways to make a statement on the exterior of the house though is to paint your front door in a high-impact colour. Whether indoors or out, a statement wall is a great opportunity to experiment with pattern or colour and to inject your personality into your space – and it’s a trend that’s catching on.